Wanda Smolinski Kaldowski was my mother's older sister, the first of four children of Helena Kalinowska and Boleslaw Smolinski. She was born in New Jersey, before my grandparents decided to return to Poland, where they would live about a year before emigrating again to the United States. Aunt Wanda was one of those people I knew for many years, but never really knew at all, which I think is common in relationships with those who are your uncles and aunts, in-laws or parents of friends; that is, people you can't bring yourself to address simply by their first names. 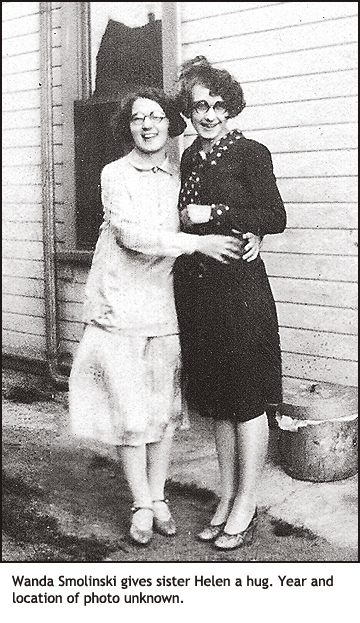 Wanda talked a lot — after all, she had given birth to my cousin Alma, the family's all-time champ in the talk department — but with me her words were usually given as advice I felt was unnecessary, though the older I got, the funnier that advice seemed. Well, not always. I'll never forget the day I drove her from our house on Russet Lane to her house on Woods Road, a drive no longer than six city blocks, and she distracted me so much with her advice on how to drive that I sideswiped a parked car. True story. However, my favorite Aunt Wanda story is on another page (Two Wild and Crazy Guys). It falls in the category of Stupid Pet Tricks, and while I know it really happened, I'm not sure Aunt Wanda just didn't get lucky. Still, she was so sure of herself. 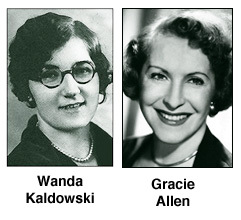 To me the incident was especially interesting because Aunt Wanda usually seemed rather humorless, but then, as she did that day on the telephone, she'd deliver a dead-on impersonation of Gracie Allen. On the other hand, it could truly be said that Aunt Wanda's husband would never ever be mistaken for George Burns. In my experience with him, Peter Kaldowski was never funny. Rather he was a prickly sort who never socialized with our family. Uncle Peter died in 1960 and thereafter Aunt Wanda was more out and about, though, she was most comfortable being mother to Alma and grandmother to James and Peter Furcinito. Aunt Wanda also enjoyed working at the St. Cecilia's Church rectory. Too late I realized I wanted to know Aunt Wanda much better than I did, to ask her questions I never dare ask while she was alive. I'm not sure it would have done me much good ... because Wanda might have been like my mother is another way. To paraphrase a familiar saying, where personal matters were concerned, my mother's slogan seemed to be, "What happens inside Helen's head stays inside Helen's head."